"Caratacus, a barbarian chieftain who was captured and brought to Rome and later pardoned by Claudius, wandered about the city after his liberation; and after beholding its splendor and its magnitude he exclaimed: 'And can you, then, who have got such possessions and so many of them, covet our poor tents?'" When, in AD 43, the Romans marched against Camulodunum, the tribal capital of the Catuvellauni, their king, Cunobelinus, had been dead for several years. His sons fought to defend the kingdom but were defeated. One was killed and the other, Caratacus, unlikely to receive support from tribes still resentful of their once powerful neighbor, took refuge with the Silures in Wales. Other native leaders, including Cogidubnus, Prasutagus of the Iceni, and Cartimandua, queen of the Brigantes, capitulated and allied themselves with Rome. Caratacus continued to resist the Roman occupation until, in AD 51, he was defeated in the mountains of northern Wales. 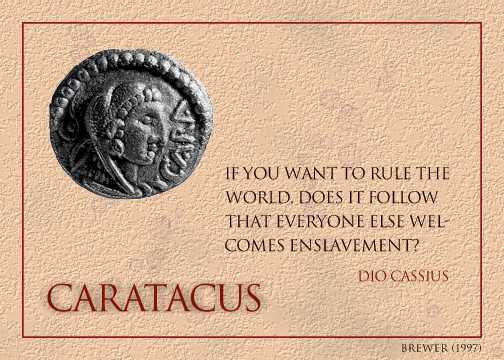 He fled to Cartimandua, but she surrendered the fugitive, and Caratacus was sent to Rome, where he was pardoned by Claudius. This betrayal by Cartimandua caused a breach with her husband, Venutius, whom she divorced, taking his armor bearer as her consort. There was war and, twice in AD 57, the Romans were required to intervene to save the queen. But, in AD 69, following the suicide of Nero, the Romans were embroiled in their own civil war and unable to prevent Venutius from driving her out. The client kingdom of the Brigantes, which, says Ptolemy, stretched across Britain from sea to sea and had, from the time of Claudius, protected the northern flank of the province, now was lost to Rome. It was as Tacitus said, "Venutius inherited the throne, and we the fighting." In AD 71, Vespasian appointed Petillius Cerialis governor of Britain, who, from a new legionary fortress at York, "at once struck terror into their hearts by attacking the state of the Brigantes, which is said to be the most populous in the whole province. After a series of battles, some not uncostly, Petillius had operated, if not actually triumphed, over the major part of their territory." The image pictured on the coin is that of Hercules, who can be identified by the lion skin he wears. The letters spell "Cara [tacus]."